9 days in Quartzite | Adventures Unleashed! January 30, 2018 January 30, 2018 / AdventuresUnleashed! I have to admit, I wasn’t sure I was going to enjoy Quartzite. Hundreds of RVs, ORVs and people all hanging out on a flat piece of desert. I know it’s a destination for rock hounders and gem aficionados, when the rock and gem shows are in town. This time of year is a big RV event. RV sales and parts, clothing, vendors of all sorts, congregate in town. Outside of town there is free boondocking camping on BLM land. My friends drive an Alpine coach and they meet with other Alpine owners to socialize and talk shop about their home on wheels. One thing I found is I had some serious “solar envy”. You will see RVs of all styles with the most elaborate solar setups…some never even needing to fire up their generator! Groups can get a bit cliquish, trying to save a section of desert for their friends…there is plenty of desert to be had, so if you’re not welcome in one area you can move to another. It’s all pretty level, with hardpan and rocks. Little sticker plants abound. The sunsets are gorgeous and some of the best star viewing around, with very little light from town or surrounding RVs. I didn’t expect to see the beauty that greeted me here. The mountains are glorious. Majestic saguaro cactus, as well as ocotillo, cholla and other favorites. The one thing about the desert to keep in mind with your dogs…there are lots of things to stick and poke your pups. My Sheltie, Patches, I had when growing up was a cautious dog and rarely needed to have a cactus spine removed from her feet. Kylie, is also fairly cautious, though I did have to remove a spine from her leg muscle after she chased after Korda through an area of cactus. Korda, on the other hand…she seemed to be magical how she didn’t seem to pick up any cactus thorns. Then, she wasn’t. The worst was off on a 4 wheel trip she managed to get cholla clumps stuck in all 4 feet. Then, when she went to remove one of them with her mouth she imbedded a spine in her gums. I plucked them all off of her, the one in her mouth gave the most resistance. She is a real trooper, and didn’t even whimper. There is a dog park in town. It’s separated into large dogs and small dogs. There is patches of grass and agility equipment. I chose to walk my dogs in the desert. I would look for washes and roads where there were less likelihood of the dogs picking up stickers and thorns. I also enjoy being able to take in the surrounding beauty while getting a little exercise. One day I joined a friend, Dawn Roll Bailey and her husband, Rich, to do some desert exploring. They were camped at the Kofa National Wildlife Refuge, an area I would enjoy boondocking at in the future. Kofa was named after the K of A mine that was in the area. Rich and Dawn were driving a RZR ATV and I was following in my Jeep. We first drove up to a horse tank. The tanks are a natural occurring depression that collects water and is used by wildlife. The tanks in this area have been enhanced by concrete spillways added by the U.S. Fish and Wildlife Service to help larger levels of water to be retained. They are located in many locations throughout the refuge, and are utilized by all the wildlife. We then drove a 4×4 road up by some other tanks and mines. Beautiful views and fascinating plants and terrain. Rich and Dawn spotted some Bighorn Sheep ewes along the mountainside. One ewe even had a lamb with her. They spotted more in another location where we decided to turn back from. Sadly, we had to hurry back to camp as there were squalls going on in the surrounding mountains and we didn’t want to be caught up in a flash flood. Dawn and Rich had gone down one road, the day before, that had some blooming cactus and hummingbirds and we were hoping to go back that route. One thing you will learn, if you are new to RVing. It’s a constant state of repairing and fixing things. My refrigerator stopped working, one evening. Todd read about some of the local repair places and I chose Mobil Tech RV & Air. Jesse Beckett is the owner. When I called he said there was a $150 service charge to come out to the BLM land. I chose, instead, to drive to his home and park on the 2 acre gravel lot he has behind his home. He offered power, water and a dump to use while waiting on repairs. It was a minor fix for the refrigerator, and I talked to him about the other things that weren’t working. So the next morning he installed a new toilet (the old one was leaking and it’s almost cheaper to just install a new one rather than replace the seals and the time it takes to do that), and two new overhead lights that the ballasts had stopped functioning. We replaced them with LED lights, brighter and use less energy. He’s also added some seal to the bullnose (he checked my roof, said you can tell a lot about an RV by it’s roof) said it looked great, but suggested I add some sealant to the bullnose. He also managed to track down a part for my awning that had stopped working. Kudos to him, as two other RV repair places said it was obsolete and they couldn’t help me. A little aside, Poulsbo RV where I bought my vehicle was supposed to replace the awning that wasn’t working. They insisted they do the work and “make things right”. Well…they just piecemealed it together and left a bunch of the old parts in place. It worked two whole times before stopping working all together. I do NOT endorse buying an RV from Poulsbo RV. The man that had the part recommended just bypassing the circuit board (which would cost $198 wholesale) and putting in a switch which would cost $35. On my way back out to BLM land, I stopped at the RV Pit Stop. Here you can get drinking water, fill your water tank on your RV, get propane and dump your tanks. Be prepared for long lines and lots of time spent in those lines, when there is anything going on in town. There isn’t much in the way of dining in Quartzite. We ate at the Yacht Club two nights. The food was ok, nothing special and it’s crowded, hot and service is slow. It could just be this time of year, but I wouldn’t go back. I went to the “big tent” at the end of one day, traffic can be atrocious late morning to early afternoon. I first stopped by the Roadmaster tent. Roadmaster is a quality, made in the USA, tow system for vehicles. While I went shopping in the big tent, they removed and replaced some locks (the guts had fallen out of one of them), replaced some bushings, my hooks and cables, and lubed the system. They didn’t charge me anything for it, only asked to donate to the tip jar for the guys doing the work. Inside the tent there are vendors of all kinds. Lots of RV products but also things that you would see at a state fair too. I got a couple of coupons for free nights stays at a couple of RV resorts, chemicals for my toilet, a magnet pocket that I could carry my keys and phone in when I hike in the desert, as well as lots of maps and info for other states I’d like to visit. 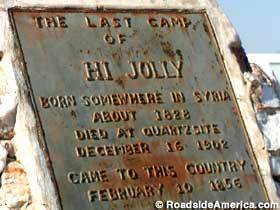 Quartzite has some fascinating history, and a stop at the Hi Jolly monument is worth the stop. “In 1856, Secretary of War Jefferson Davis had a novel idea: transporting freight and people across the desert Southwest on camels. He eventually imported over 70 of the beasts. Along with the first batch came a Syrian caretaker, Hadji Ali. His American masters called him Hi Jolly. A plaque on Hi Jolly’s tomb says of the camel experiment: “A fair trial might have resulted in complete success.” But the Civil War intervened, Jefferson Davis changed jobs, and without his support the project was abandoned. The camels were set free to fend for themselves in the desert near Quartzsite. Hi Jolly remained, living into his seventies. The locals were so fond of him that, after he died, they spent several weeks building Hi Jolly a special pyramid tomb, made of multicolored petrified wood and quartz. It was dedicated on Jan. 4, 1903. Thirty-three years later the Arizona Highway Department came along and cemented a bronze plaque to the tomb, telling Hi Jolly’s story, and topped the pyramid with a metal camel silhouette. If you venture to Quartzite, and choose to boondock (there are RV parks with hookups) you can choose to be as isolated or as social as you’d like. Next stop, Yuma! ← A bit of England in the middle of a desert?